One of our greatest assets…the outstanding individuals who work with us. After you get to know them, we are sure you'll agree. We hire people with caring attitudes and exceptional people skills, and we instill pride in running the highest quality rafting trips in the industry. Guests routinely compliment the warm and friendly personalities and professionalism of our guides. They are true professionals who have a love for rivers, an appreciation for nature, and gain great satisfaction from sharing it with others. Although drawn to All-Outdoors from a wide variety of backgrounds, our guides all share a passion for running rivers, and would love to share it with you! "To put it simply, the trip was fantastic! The guides were some of the most professional, courteous, safe and well trained individuals I have met in a long time." 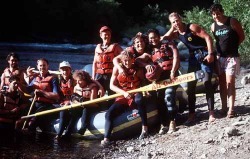 Meet the guides of All-Outdoors by checking out Guide Bio's on the All-Outdoors California Rafting Blog. 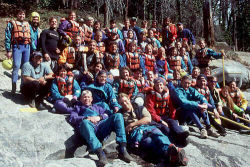 Feel free to post comments about your favorite guides or share experiences you had while rafting with All-Outdoors. Most of our guides acquire their initial guiding skills by attending our guide school. Each guide is certified in First Aid and CPR. Most are also certified Swiftwater Rescue Technicians. This rescue certification program is taught by our in-house nationally certified Rescue 3 instructors, and it keeps our guides up-to-date and proficient in the latest river rescue and emergency training procedures. We regularly conduct interpretive workshops to provide our guides with additional information on the natural, cultural, and political history of California's rivers. We are proud of our staff and we know you will enjoy this fine group of people. For more information about our guide school training, visit our Professional Guide Schools page. "Our guide, Mick, was full of personality and very knowledgeable. We all felt very safe in his hands".